This attractive casual handbag is accented by bold distinctive lacing. The front pocket (7 1/4" x 4 1/4" x 1") has plenty of room for keys, sunglasses, lipstick, cell phone and more. Size is: 9 1/2" x 6". 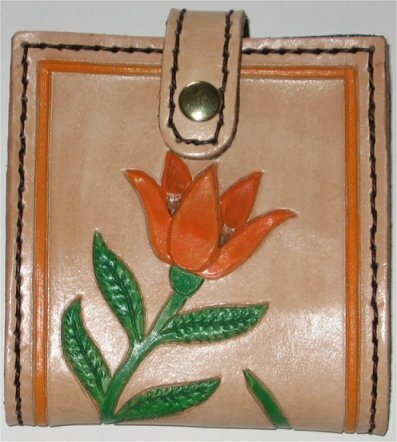 This attractive purse has a top flap that secures with an easy turn gilt clasp. 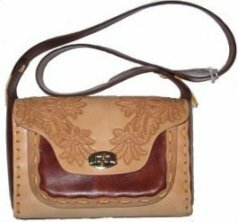 The long, detachable shoulder strap can be cut to anyone's liking. Purse measures 9" x 9" x 4". This purse has all of the necessary pockets that are needed for every day use. 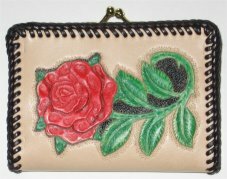 Bill Compartment, coin purse, credit card and photo pockets plus, room for your checkbook and register. 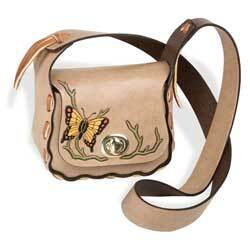 This Purse has all of the necessary pockets that are needed for every day use. 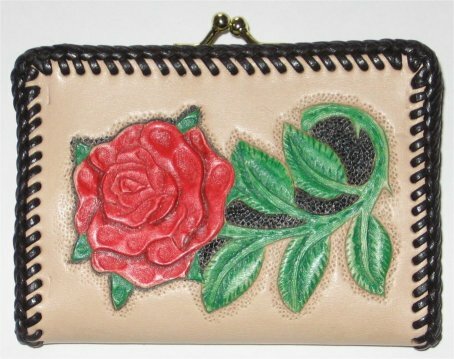 Bill Compartment, coin purse, credit card and photo pockets plus, room for your checkbook and register. Beautiful Nature Tan with minimum tooling. Just Beautiful. This bag is so cute, you just have to see it in person. Styled after the Vista but smaller. Shoulder strap and top flap that secures with a gilt clasp. Measures 6 1/4" x 4 1/4" x 2 3/4". Perfect for those quick trips requiring only the necessities for anyone, and a young ladies delight. Measures 4" x 5 1/2" x 2 1/2". What a unique idea, a wallet and clutch purse combined. Interior has place for bills, two pockets, five credit card slots, window for ID card and coin purse with a twist closure. Measures 4 5/8" x 4 7/16" closed. Holds credit cards, bills and coins. Measures 4 1/2" x 3 1/2" closed. Zippered wallet has two pockets for coins and other small items.